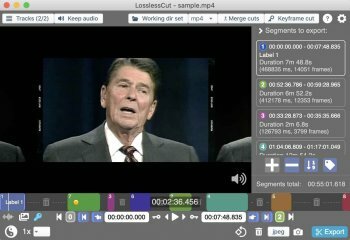 LosslessCut is a simple, cross platform video editor for lossless trimming / cutting of videos. Great for rough processing of large video files taken from a video camera, GoPro, drone, etc. Lets you quickly extract the good parts from your videos and discard GB of data without losing quality. It doesn't do any decoding / encoding and is therefore extremely fast. Also allows for taking JPEG snapshots of the video at the selected time. This app uses ffmpeg for doing the grunt work. Also supports lossless cutting in the most common audio formats. Pretty good for free. Seems to work well, though bare-bones and a limited range of file types that can be imported.